For those unfamiliar, there's a tournament up in Edmonton, Alberta called the Brick Tournament held each year that bills itself as the highest level tournament for 10-year old hockey players. I'm over simplifying it but, essentially, it's a tournament of all-star teams fielded from across North America and an occasional entry or two from Europe. It's called "The Brick" because it's sponsored by the Canadian furniture retailer named the Brick. 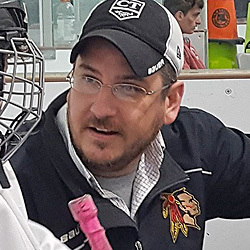 Now, like any "high end" team, you don't just throw together a bunch of 10 year olds a few months in advance, no, you have a feeder program to groom a bunch of elite players *years* in advance that will eventually be the narrowed-down roster that competes in the tournament when they're 10 years old. The tournaments these younger players participate in are called the Brick Series. Kinda like Varsity and Junior Varsity. Same commitment, less prestige. Duncan was only 7 (going on 8) at the time so he was gearing up to get on the preliminary roster 2 years before his "Brick" season. The try out was held on Veterans Day (an off school day so it was more convenient for kids to attend) at the New England Sports Center in Marlborough, Massachusetts and consisted only of a scrimmage. For real, they took 60 kids, split them in two, had some midget or junior players (mostly goofing off) run the bench doors, and had them play a full ice game against one another. That's it. Granted, this is an excellent way to isolate the players that have serious puck aggression and, without question, there were maybe 6 or 7 players that were heads and tails above the rest. Total puck hogs but very, very skilled little hockey players. The other 50 players all kind of looked the same, getting the occasional puck touch before having one of the studs (often someone on their own team) steal it and attempt to go coast-to-coast, stickhandling into a 5-man gauntlet when there were four teammates wide open calling out for a pass. The team Duncan plays for during the regular season doesn't play this way. We have a few kids that are capable of going coast-to-coast like that but they've been coached out of that mentality. Sure, YOU can score 40 goals this season but if you dish it off more or start sending other kids in on clean breakaways, our TEAM can score 600 goals. We'd defeat teams with more skilled rosters regularly because we'd pass to the open man at the far post with a wide open net rather than try to snipe it over the shoulder of the goaltender hugging the near post. Five percent chance of scoring versus a ninety percent chance of scoring. Really, it's a no brainer. Pass the puck even if it's to someone less skilled. We've only had a couple players defect due to this "win-the-game" strategy trumping the "pad-my-stats" method of playing hockey but it's made our team even more effective. Here, though, at the tryout, getting open at the far post in a shooting position pretty much left you out in the cold. There wasn't any passing. To be "noticed", it was as though you had to take it upon yourself to battle all 10 players on the ice. Nearly every possession included a player taking it away from their own teammate! It was almost like watching a low level in house team, a swarm of bees, chasing the puck all over the place with a handful of kids, like Duncan, way off on the perimeter either bored or awaiting an outlet pass that was never coming. For the life of me, I can't imagine how the team was ultimately selected based on this tryout. The handful that were able to acquire the puck and play keep-away, yeah, sure, pick them. The rest? The vast majority... Who knows? In the end, Duncan was selected as an alternate. My first impression was that it was a less offensive way of saying, "Sorry, you didn't make the cut" but upon speaking to other parents of kids who were also at the tryout, they actually did tell others that they just weren't at the skill level required. As the scheduled tournaments in the 2017 Brick Series came and went, Duncan was not added to the roster for any of them. I wasn't surprised -- I was at the tryout and, outside of being able to play his position like he's been coached to do, he was invisible with maybe one or two brief puck possessions. I wouldn't have selected him either and I didn't expect a call. It was a great experience to have him skate alongside those that are considered to be the most elite players, top 10% skill-wise, in New England at his exact age level. He was not among the best players, no, but he was in the conversation and did not look out of place at all. That was worth the $69 tryout fee. And, as such, Henrik will likely try out for the team next year as well. I should also note that we live in striking distance of the Connecticut Junior Rangers which also field a team in the Brick Tournament. It's a long rumored thought that the Rangers tryouts each December are strictly fundraisers where they make you think you're trying out for the team but they've, in fact, already filled up most of their roster and are actually only looking for a couple more skilled guys to complete the roster -- even two years in advance of the 10-year old season. I'll admit, I got that vibe too as when Duncan took the ice in his adult sized Jr Bruins tryout jersey tucked in and folded over repeatedly, there were probably 15 or so players on his bench that had full blown Jr. Bruins uniforms on with their names on the back and everything. Open tryout? Eh, probably not. But if your son or daughter is looking to try out for one of these elite tournament teams, my best advice to pass along is, "Get the puck! And once you have it, don't give it up." 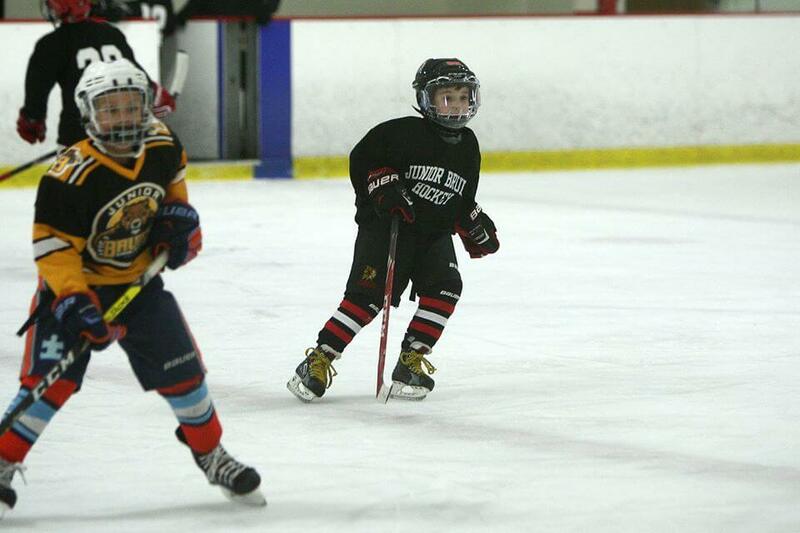 » Youth Hockey: Should You Play "Up"?